I’m going to Sweden this month to speak at their annual public-sector jamboree. It will be my third time. I’m speaking alongside a public-sector client that has made profound improvements in adult social care. Every time I have been to the jamboree they have had an American lean guru spouting nonsense and this is no exception. This time it’s the guru who claims lean fails because it is what he calls ‘fake lean’ and his lean is the way to go! His ‘real lean’ starts with ‘respect for people’. I can imagine ‘respect for people’ events and tee-shirts (he sells tee shirts) while there is no change to the system conditions that drive misery and other forms of sub-optimisation. Only in America; the home of the terrible diseases. What would you call a profound idea in this guru’s head? A tourist! As a teacher, I see this as nothing more than a student who does not understand. As I researcher, I have long seen this perspective as an important problem that requires careful study to help students understand. 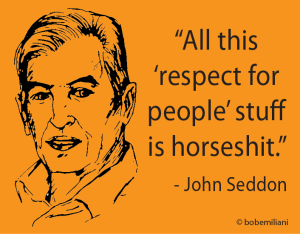 John is representative of many, many people who do not understand the history or significance of the “Respect for People” principle in Lean management. So, I offer this critique of his perspective. The real issue is cloaked behind the ad hominem attack, misdirection, and deception. John’s core criticism pertains to the “Respect for People” principle. As he sees it, “Respect for People is not a point of intervention.” Brilliant! Nobody ever said it quite like that before. John has made explicit what for many people is implicit – the view that the Respect for People principle is not a point of intervention. Kudos to John for revealing his misunderstanding so clearly! John crystallized why leaders ignore or fail to comprehend the “Respect for People” principle: they do not see it as something that results in a change to the system. Unfortunately, they fail to recognize that the pioneers of progressive management created the “Respect for People” principle for use as an intervention – a practical countermeasure for zero-sum (win-lose) continuous improvement (what I call “Fake Lean,” e.g. HMRC) – and found it to be highly effective when applied thoughtfully and consistently over time. The obvious can be difficult for many to see. Further, John sees “Respect for People” as not relevant because “culture is a consequence of the system.” My research shows the reverse to be true, but no matter. I’ve worked steadily for years to create new, practical ways to make the “Respect for People” principle a point of intervention. Then, building on my past research, I began a few years ago to think of leadership in terms of processes (a revolutionary idea; no more “art of leadership!”). I thought back to my own experiences as a leader in industry and asked myself: “What work did I do? What processes was I engaged in?” I discovered that most of my work centered around 15 leadership processes. Next, I asked: “What types of leadership process errors did I make or see others make in their.” I was able to think of around 150 distinct types of errors, and while my graduate students find 370+ errors (about 25 distinct errors per leadership process). Knowing the leadership process and the common errors that just about every leader makes every day allows one to finally correct these recurring errors. How? It is simple: by using visual controls, standard work charts, and standard work combination sheets. I wrote these findings in an book titled: Nobody is Exempt From Improvement (republished in 2015 as Speed Leadership). The book shows yet another way to make the “Respect for People” principle a point of intervention (notwithstanding John’s criticism of standardized work). The system is changed by improving leadership process through the elimination of leadership process errors, which reduces both process waste and behavioral waste (which John, I surmise, does not believe exists), as well as unevenness and unreasonableness. It’s the system and the people. The “Respect for People” principle was not manufactured recently by Americans to save Lean. The “Respect for People” principle is not a ploy to make money. The “Respect for People” principle is a practical countermeasure for zero-sum (win-lose) continuous improvement (Cho-san’s correction to Ohno/Suzumura-style kaizen). The “Respect for People” principle is a point of intervention. The final seminal moment will come when John realizes that the “Respect for People” principle is a point of intervention for more than just employees. It is a point of intervention for suppliers, customers, investors, and communities as well. I’d love for John Seddon to explain why, if “respect for people” is a Western invention, why the Toyota visitor center in Japan highlights the concept so prominently as seen in this photo? Showing respect is a very active thing we should do every day, as Lean leaders. Respect isn’t a vague concept or an end result… it’s something we do and demonstrate. I’m sure Toyota leaders take very active steps to demonstrate respect by encouraging their employees to think every day. That could be difficult for Mr. Seddon to do. Typically, the people who are the greatest critic of something are the ones who are least able to see it, comprehend it, or put it into practice. They will do all they can to diminish it in the eyes of others, and do so forever to avoid being seen as wrong. Wouldn’t it be interesting to find out why Mr. Seddon thinks that way? I suspect anyone can make a case against his intelligence, or smartness – It would certainly go against the lean pillar being discussed here. I like Lyssa Adkin’s “everyone is a little right” perspective, and, looking at people as little behind in their journey to where we are, and not as hurdles. Entities that seek the silver bullet approach are naturally drawn to a tidy, packaged approach. Who can blame them! A simple (on the surface) 2 point approach of Continuous Improvement and Respect for People means leadership must face some closet items they most likely would like to avoid. Non-zero sum thinking would mean if the transformation failed, they would need to look in the mirror. Who needs that! ;-0 All I can say is I would much rather give my time an talents to an org that practices a what Bob is saying! Btw: I am a lean enthusiast myself and can’t agree more with Bob Emiliani’s (or simply lean’s) point of view about “respect for people”. I think John Seddon’s opinion emphasizes on the importance of the foundation of lean – management’s role as lean thinking teachers, without which the pillars won’t sustain. Seddon says the guru he is attacking sells tee shirts. Do you sell tee shirts? Indeed I do… Tee shirts and more. The idea behind these products is two-fold: 1) to reward people who have participated in kaizen, and 2) for use as personal or organizational visual controls to promote and practice REAL Lean. I felt that something more needed to be done to help help improve organizations’ Lean transformations, and that this could help (especially when used as visual controls). Too much of what we have seen in recent years is Fake Lean accompanied by little actual improvement. So, there is a purpose for these products – team spirit and daily practice – that goes far beyond the superficial way Mr. Seddon interpreted them. What does a “respect for people” intervention look like? What does it consist of? I’d state it much more simply… that “respect for people” is a matter of the daily interventions or actions that a manager takes. 1) Instead of yelling and blaming workers for not hitting production or quality goals, a leader chooses to practice respect by going to see first hand and working together with people, engaging them in the improvement process. 2) Instead of giving people unachievable jobs and targets, a manager shows respect by working together with employees to design the work and support systems and makes sure that everybody has what they need to do their jobs the right way. Respect isn’t a vague broad concept, it’s expressed through the daily actions of Lean leaders. Now, if Seddon is saying that a “point of intervention” would be something that changes a disrespectful culture to a respectful one, how do we make that happen? Do we have a reality-TV-style “intervention” and bring the bad managers (like I’ve seen first hand at GM and other companies) and say “you need to start treating people with respect and here’s how you do it”?? Some managers are so damaged by decades in a bad system (like GM when I was there 1995-1997), that they need to be just retired to the dustbin of managerial history. That said, SOME leaders can and do change. John Toussaint MD tells the story of how he was not always a “lean leader.” At ThedaCare, they had moved the needle enough on changing the culture that employees started challenging him and asking him when HE was going to change the way he managed (and he had supportive board members putting pressure on him to change). It didn’t *start* with him looking in the mirror, but that “intervention” required that personal transformation. It consists of teaching senior managers, in different ways, about the existence and consequences of behavioral waste. The resultant learning transforms continuous improvement from zero-sum (win-lose, where people are harmed) to non-zero-sum (win-win). This greatly expands and improves participation in kaizen and results in improved material and information flows (less time lag between problem identification and the application of practical countermeasures, and shorter intervals between PDCA cycles). The subject matter used in teaching and to promote daily practice (learning) has been summarized in the workbook Practical Lean Leadership, the e-book Nobody Is Exempt From Improvement, and the book Moving Forward Faster. It’s funny to me how these Toyota employees just buy into this “horseshit” as Seddon calls it. He might want to reflect on whether actual Toyota leaders know more about this than him. So says Deryl Sturdevant, a senior adviser to McKinsey, was president and CEO of Canadian Autoparts Toyota (CAPTIN) from 2006 to 2011. Prior to that, he held numerous executive positions at Toyota, as well as at the New United Motor Manufacturing (NUMMI) plant (a joint venture between Toyota and General Motors), in Fremont, California. – 95 per cent of what drives performance is outside of an individual’s control. I’ve seen a CEO talk about how his staff would ‘clock watch’. According to the people in the work, they now care much more about making a difference. ‘It’s as if they are running a small business.’ They gather data from customers about what’s getting in the way. They are empowered to improve. They are ‘motivated’. Was this motivation caused by the CEO? Certainly the CEO didn’t falsely attribute performance gains to himself. He noticed a change when people realised their redesign was generating improvement. People became motivated to get more improvement. Seddon is saying intervene on system. Motivation will take care of itself, intrinsically.